She can expect some cramping and pain for a few days after insertion. Suggest ibuprofen (200–400 mg), paracetamol (325–1000 mg), or other pain reliever as needed. Also, she can expect some bleeding or spotting immediately after insertion. Discuss how to remember the date to return for removal or replacement. 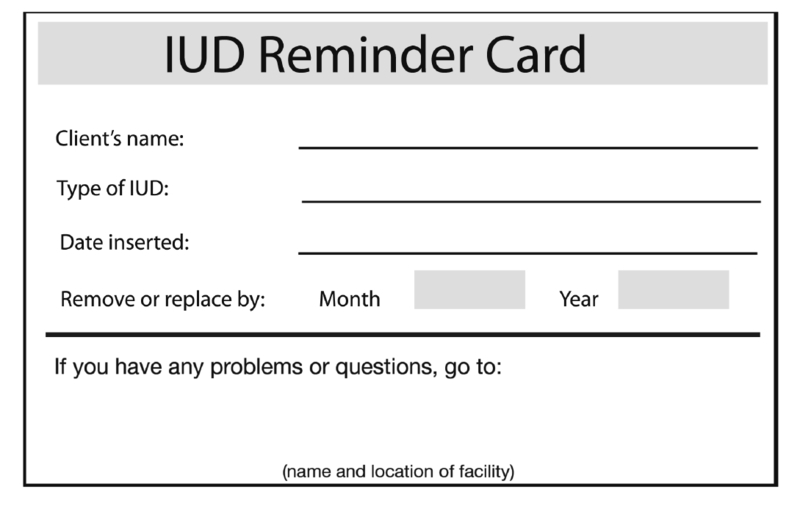 Month and year when IUD will need to be removed or replaced. A follow-up visit after her first monthly bleeding or 3 to 6 weeks after IUD insertion is recommended. No woman should be denied an IUD, however, because follow-up would be difficult or not possible.